Jurassic Park movie franchises, according to Aaron Neumann, product development manager. 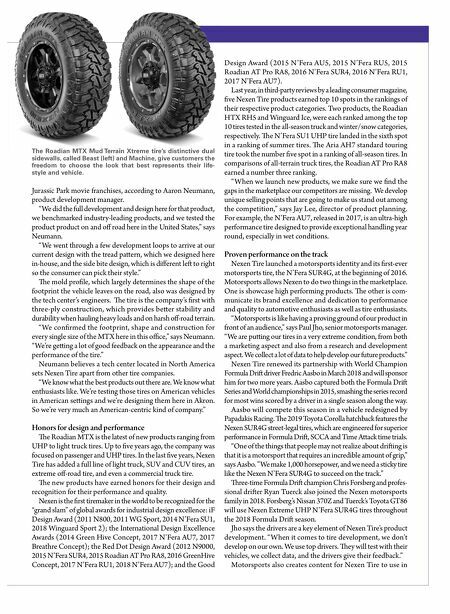 "We did the full development and design here for that product, we benchmarked industry-leading products, and we tested the product product on and off road here in the United States," says Neumann. "We went through a few development loops to arrive at our current design with the tread paern, which we designed here in-house, and the side bite design, which is different le to right so the consumer can pick their style." e mold profile, which largely determines the shape of the footprint the vehicle leaves on the road, also was designed by the tech center's engineers. e tire is the company's first with three-ply construction, which provides beer stability and durability when hauling heavy loads and on harsh off-road terrain. " We confirmed the footprint, shape and construction for every single size of the MTX here in this office," says Neumann. "We're geing a lot of good feedback on the appearance and the performance of the tire." 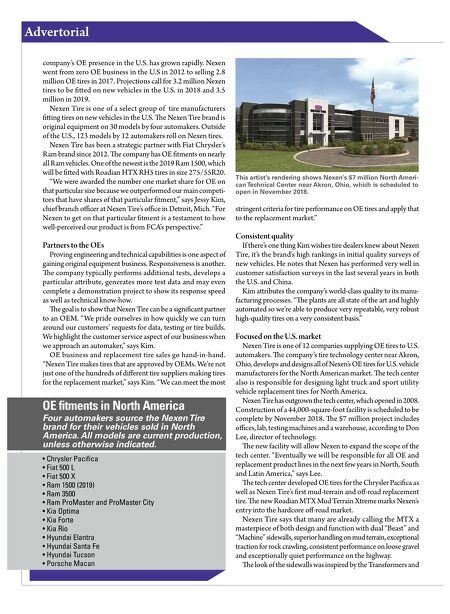 Neumann believes a tech center located in North America sets Nexen Tire apart from other tire companies. "We know what the best products out there are. We know what enthusiasts like. We're testing those tires on American vehicles in American seings and we're designing them here in Akron. So we're very much an American-centric kind of company." Honors for design and performance e Roadian MTX is the latest of new products ranging from UHP to light truck tires. Up to five years ago, the company was focused on passenger and UHP tires. In the last five years, Nexen Tire has added a full line of light truck, SUV and CUV tires, an extreme off-road tire, and even a commercial truck tire. e new products have earned honors for their design and recognition for their performance and quality. Nexen is the first tiremaker in the world to be recognized for the "grand slam" of global awards for industrial design excellence: iF Design Award (2011 N800, 2011 WG Sport, 2014 N'Fera SU1, 2018 Winguard Sport 2); the International Design Excellence Awards (2014 Green Hive Concept, 2017 N'Fera AU7, 2017 Breathre Concept); the Red Dot Design Award (2012 N9000, 2015 N'Fera SUR4, 2015 Roadian AT Pro 8, 2016 GreenHive Concept, 2017 N'Fera RU1, 2018 N'Fera AU7); and the Good Design Award (2015 N'Fera AU5, 2015 N'Fera RU5, 2015 Roadian AT Pro 8, 2016 N'Fera SUR4, 2016 N'Fera RU1, 2017 N'Fera AU7). Last year, in third-party reviews by a leading consumer magazine, five Nexen Tire products earned top 10 spots in the rankings of their respective product categories. Two products, the Roadian HTX RH5 and Winguard Ice, were each ranked among the top 10 tires tested in the all-season truck and winter/snow categories, respectively. e N'Fera SU1 UHP tire landed in the sixth spot in a ranking of summer tires. e Aria AH7 standard touring tire took the number five spot in a ranking of all-season tires. In comparisons of all-terrain truck tires, the Roadian AT Pro 8 earned a number three ranking. "When we launch new products, we make sure we find the gaps in the marketplace our competitors are missing. We develop unique selling points that are going to make us stand out among the competition," says Jay Lee, director of product planning. For example, the N'Fera AU7, released in 2017, is an ultra-high performance tire designed to provide exceptional handling year round, especially in wet conditions. Proven performance on the track Nexen Tire launched a motorsports identity and its first-ever motorsports tire, the N'Fera SUR4G, at the beginning of 2016. Motorsports allows Nexen to do two things in the marketplace. One is showcase high performing products. e other is com- municate its brand excellence and dedication to performance and quality to automotive enthusiasts as well as tire enthusiasts. "Motorsports is like having a proving ground of our product in front of an audience," says Paul Jho, senior motorsports manager. "We are puing our tires in a very extreme condition, from both a marketing aspect and also from a research and development aspect. We collect a lot of data to help develop our future products." Nexen Tire renewed its partnership with World Champion Formula Dri driver Fredric Aasbo in March 2018 and will sponsor him for two more years. Aasbo captured both the Formula Dri Series and World championships in 2015, smashing the series record for most wins scored by a driver in a single season along the way. Aasbo will compete this season in a vehicle redesigned by Papadakis Racing. e 2019 Toyota Corolla hatchback features the Nexen SUR4G street-legal tires, which are engineered for superior performance in Formula Dri, SCCA and Time Aack time trials. "One of the things that people may not realize about driing is that it is a motorsport that requires an incredible amount of grip," says Aasbo. "We make 1,000 horsepower, and we need a sticky tire like the Nexen N'Fera SUR4G to succeed on the track." ree-time Formula Dri champion Chris Forsberg and profes- sional drier Ryan Tuerck also joined the Nexen motorsports family in 2018. Forsberg's Nissan 370Z and Tuerck's Toyota GT86 will use Nexen Extreme UHP N'Fera SUR4G tires throughout the 2018 Formula Dri season. Jho says the drivers are a key element of Nexen Tire's product development. "W hen it comes to tire development, we don't develop on our own. We use top drivers. ey will test with their vehicles, we collect data, and the drivers give their feedback." Motorsports also creates content for Nexen Tire to use in The Roadian MTX Mud Terrain Xtreme tire's distinctive dual sidewalls, called Beast (left) and Machine, give customers the freedom to choose the look that best represents their life- style and vehicle.